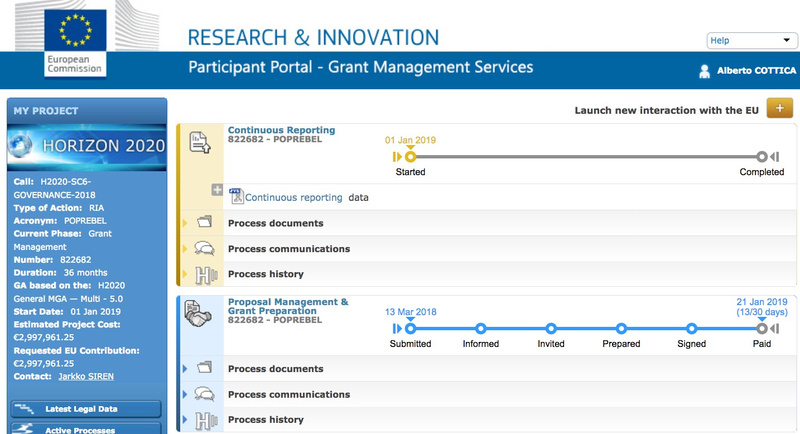 The Funding and Tenders portal is the new single point of interaction between beneficiaries of EU research grants and the European Commission. It replaces the Participants portal, which at the time of writing is still active but is scheduled to be mothballed. The Commission demands that beneficiaries engage in something called continuous reporting. The idea is this: project proposals contain a timeline for deliverables (like reports and websites) and milestones (like “prototype software up and running” or “500 signups achieved”). Each of these is expected to happen at a specific point in time. Traditionally, EU projects count in months starting from the project date. So, M10 for a project that starts on October 1st, 2020 corresponds to the and of July 2021. Log in. As project manager, you will need an account with the appropriate level of access to the project in question. Click on “My projects” in the “My Area” menu item. Locate the title of the project you are reporting on, then click on the MP (“Manage Project”) icon on the corresponding row. Locate the deliverable you are reporting on, and click on the green Upload icon. @alberto could you also include who is supposed to enter the completion of a deliverable or milestone? Which will be an internal convention in Edgeryders OÜ, obviously. @alberto Thanks, Have not followed the news in EU funding ecosystem for almost 2 years now but I was exploring lately the idea of founding a coding school for kids in one of Croatia’s poorest regions and including a basic fablab concept so kids can do some more fun things, be creative and see their creations printed out directly. I know national calls for proposals in Croatia but if you know of any at EU level, applying directly here, feel free to share :). @alberto could you also include who is supposed to enter the completion of a deliverable or milestone? Will do, though this does not seem to be research proper. Am I wrong? You are correct :). I know you are a very busy man and there are many calls out there, just saying in case you run into something similar . I will be going through the new platform anyways, see if I can conform the project with conditions from one of societal challenges/education/creativity focused calls or innovative rural business models etc…if i remember well there were interesting possibilities there. Last time I wanted to start this project I got many open doors , many interested people, but after talking with people from education they told me they are integrating IT more seriously in high school already. I thought, okay maybe they took it seriously finally and there is no more need for such a project. I had many things on my plate so I let it go. Recently though I visited Croatia and found out their education program didn’t improve much and is pretty boring as well so I set it as my goal to push for this in 2019, make a successful pilot project in municipality where I have most contacts and hope it will be replicated elsewhere :). Yes, this is what we are here for. If you find something you want to research, we can try to support that effort, by offering the infrastructure developed in the last few years.